Should I Repot My Beautiful Valentine's Day Orchid? I received a beautiful orchid plant from my boyfriend for Valentine's Day. It came in the mail and one of the flowers was semi-crushed. It came in a glass square vase (see picture) and the directions told me not to water it for two weeks and keep it away from direct sunlight. I've done that and my plant is doing fine. A new bud has blossomed since I received it. My concern is that after reading a lot about orchids and Phalaenopsis Orchids specifically (I believe that is what I have), I'm worried that since the vase is solid glass there is no way the plant can drain when i water it. After two weeks of waiting, I just watered an egg-sized amount of room temperature filtered water. Since my plant is in bloom (4 buds still left to bloom) should i re-pot it or wait until all the flowers fall? This plant is really special to me and I want to ensure its health and longevity. Comments for Should I Repot My Beautiful Valentine's Day Orchid? 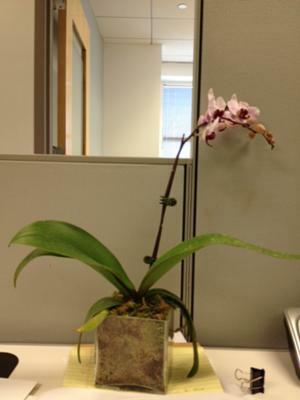 Thanks for your question regarding re-potting your blooming Phalaenopsis Orchid. It is a beautiful orchid and a lovely Valentine's Day gift! As I can see in the picture it is in a small glass vase. The advice to keep it from direct sunlight is good. Phalaenopsis like bright indirect light. I am surprised that they said to only water it once in two weeks. In most environments that might not be enough. But it may be fine in yours. Your concern about drainage is very well taken. Phalaenopsis are very prone to root rot and need to be in pots that drain. I would pay attention to the plant. If you see standing water in the bottom of the pot I recommend that you re-pot. And I would consider re-potting it anyway as it sounds like you really want to take good care of this orchid. I generally do not re-pot Phalaenopsis when in bloom unless I need to. But in this case I might. Since this plant is important to you (and I get it as they are all important to me) I would recommend that you consider re-potting. You could get a plastic pot that drains and get orchid fir bark at a nursery. Not soil. I believe you could fairly easily reach your hand or fingers into the pot and pull up the orchid and roots with the media it is in and then put it in a pot. Get a pot about the same size as the vase. Put the orchid in the new pot and fill in with the orchid bark. You can use a chopstick or a pencil to fit the bark around the roots. Then if you want to display the plant in a decorative pot put the pot into the larger decorative pot. I would recommend that you water it every 7-10 days. Do this by putting it into the sink and running water over the pot and media and let it drain. Do this a couple of times and let it drain well and then replace it into the decorative pot (if you are using one.) You can use a lead pencil (the yellow/wood ones) and push it into the media and if it is damp or has little pieces of the media stuck to it then it probably does not need water. Phals like to dry out a little between waterings.